Of your grocery budget, that is. Reflecting on how we got ourselves to an 82% savings rate, we realized that our grocery budget played a starring role in the reductions. And one of the largest culprits on our shopping list: breakfast. We were buying three different types of breakfasts to enjoy throughout the week. THREE! Insanity, I tell you! I wrote about how we frugalized our entire grocery budget, but I wanted to focus on breakfast because a) I love it, and b) we were extravagantly overspending on the first meal of the day. Serving suggestion. Though coffee is more like a serving requirement. TOTAL: approx $20.43. Per week! Oh the horror! And here we thought we were doing a good, frugal job by preparing our own breakfasts! And that is why breakfast was our hidden grocery budget destroyer. When we took our Uber Frugal Month challenge, we realized that food was by far our largest non-mortgage expense, and it still is, but we’ve managed to chop it down to $140-$160 per month. And this is ALL the food we consume: breakfast, lunch, dinner, snacks, desserts, and drinks for the two Frugalwoods adults every day. We don’t eat any meals out. But back to breakfasts. 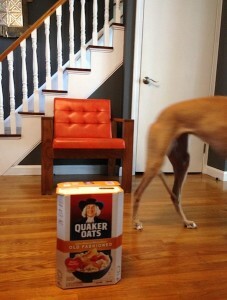 We sat down to brainstorm the cheapest possible breakfast food, other than water, and Frugal Hound came up with: OATS! Yep, good ol’ oats. They’re raw, they’re ready, they’re filling, and they’re dang healthy. 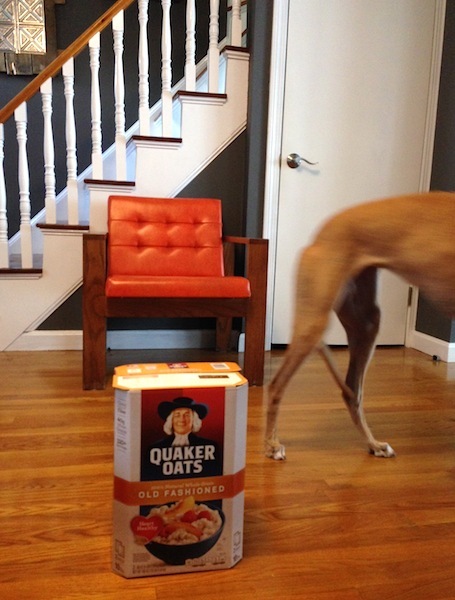 We discovered that oats are purchase-able in bulk from Costco at $7.89 for a 10 lb box (pictured above w/a greyhound). Just add water, heat, and eat! We each consume 60 grams per day, so the 10 lb box yields 75.5 servings, which lasts us 37.75 days (2 people each eating 60 grams of oats every morning). How do we know we’re only eating 60 grams? Behold: our food scale. Oats are 10 cents a serving. Saturday oats with strawberries from Aldi’s! Ever so slightly more if one adds cinnamon or some fruit. Did you hear that folks? 10 cents. For a healthy, filling, tasty meal. That’s $1.40 for the two of us for the entire week versus our flagrantly lavish $20 or so per week in the past! In a given month, this means we’re now saving $76.12 just by banishing our luxurious breakfasts. Ya’ll, that is $913.44 per year saved. I rest my case. With a breakfast this cheap, we can afford to make fancier lunches and dinners. It frees up a significant portion of our food budget to enable our weekend date night dinners and the large quantities of produce we consume. Our overall grocery spending in down, but it’s breakfasts that are way–we’re talking WAY–down. Mr. FW: disaster preparedness. Oats keep forever and won’t spoil. They’re compact and don’t take up much storage space. Mrs. FW: oats are quick and easy to cook. You can make them on the stovetop, in the microwave, or with boiling water from an electric kettle. Mr. & Mrs. collaboration: you could stuff oats into a discarded sock and make a pillow for a hamster. Mr. FW: they’re a blank canvas for aging fruit. You can throw nearly-dead fruit into your oats and it tastes just fine! Frugal Hound: I can play circus horse on the box! Optimize your breakfasts. Make them so cheap they’re basically free. Only thing cheaper would be if your breakfast paid you to eat it (let me know if you figure out how to do that, pls). What do you spend on your breakfasts? Yum, sounds good! And $1/meal is definitely a win. Go you! I make “banana bread” oatmeal. Cook 1/2 of a sliced banana, cinnamon and pecans with 2/3 cup oatmeal. I always use “old fashioned” oats and never instant. I’ve found that oatmeal tastes better when it’s made with 1/2 milk and 1/2 water. Costco dried cherries cooked with the oatmeal is really yummy, too. Cracked wheat cereal is also very cheap. It does take longer to cook but is delicious. Make it with 1/2 milk and 1/2 water because it’s richer tasting. I’ve also ground wheat berries finer than “cracked” to make a really good “Malto Meal” type of cereal. It’s a good baby cereal but you’d have to start off with a small amount at a time–just like with adults–so the baby’s digestive system can get used to it. Yes indeed! It really does keep one full until lunch. I’ve never had a more filling breakfast! Honey is a great idea too, I’ll have to try that. 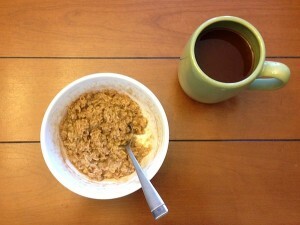 I have always had a different metabolic reaction to oatmeal. Even in high school, eons ago, oatmeal goes right through me and I’m starving two hours later. I love it, I love oats in any and everything. But for me it’s been a cup of yogurt every morning for a long time now. I toast raw nuts, raw sesame seeds, flax which I grind myself, and hemp seeds. I think I might cut back a little on some of the ingredients, just because of calorie wise it ends up being about 300 cal. Ha ha love FrugalHound’s circus horse! I eat oatmeal every other day. I have peanut butter and jam on toast the alternate days. Oatmeal is supposed to be good for heart / cholesterol too. Frugal Hound definitely loved playing circus horse (not!). Oats do have great auxiliary health benefits to be sure! 1) I thought it kind of funny that you were freaking out over $20/week for breakfast. That breaks down to $1.46/person/meal. I mean, if you extrapolated that over every meal for a month (assuming 3 meals a day) you would spend $263/mo. Which is pretty awesome. The fact that you somehow managed to get down to $160/mo on food is incredible. My wife and I struggle to stay under $300/mo for food. Of course, we dabble in eating out a few times a month, but still. We can spend $160 in a trip to Costco, no sweat. TEACH ME YOUR WAYS! 2) We looked high and low for oats at our Costco and no luck. They have to have them. I will re-investigate when we return in August. 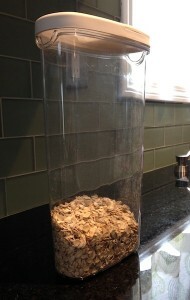 Our costco moves the oats around, but they usually are in the cereal aisle. I’d just ask a friendly costco employee… I’ve always gotten great service there. Friendly bunch of folks! I really don’t eat breakfast but if I do, it’s fruit. Fruit isn’t that cheap, so maybe that’s my problem! Food is the one major area I can use some improvements on. Agreed, we’re always trying to save more on our grocery costs–it’s just one of those expensive line items every month! We spend a lot on fruits and veggies too. We’ve worked to cut in other areas so that we can keep spending on produce. Oh my, Frugal Hound is adorable!! I love seeing the pets of other bloggers =). Hm, I know this is horrible, but I don’t always eat breakfast. It depends on how I feel when I wake up. I do eat cereal, but I always buy it on sale, and I don’t have it every day, so our milk tends to last for a while. I’m not a fan of oatmeal, but perhaps I just need to try a few different recipes. My boyfriend has been eating it for a while at least. Yes! We’ve definitely eaten them for lunch or dinner on the odd occasion. The versatility alone makes them ideal. Thanks so much for stopping by! Breakfast is by far our cheapest meal, especially in the summer. I have a smoothie every morning with greens, seeds, fruit and matcha, but in the summer I can just go out to the garden and pick some spinach (organic!) and fruit and then it’s a good price. In the winter not so much. My husband eats oatmeal every single day for breakfast at about $0.40/pop (we live in Canada, the home of the crazy prices on everything) so we do quite well for ourselves with breakfast. Yum, those sound like great breakfasts. I’m very jealous of your garden–how great! Can’t wait to explore more of your blog! Eggs with veggies sounds great! We haven’t had eggs in awhile–occurs to me they’d make a good dinner too…hmmm, you’ve given me ideas. Thanks so much for stopping by, glad to have you :)! Have you tried savory oatmeal? Add garlic/onion powder, salt and some parmesan cheese! I like to slap and egg on top And it’s amazing! Awesome work on hacking your situation. I don’t eat breakfast that often but do get free coffee at work. To change that i just purchased a protein/paleo shake mix (primal fuel). $70 for the large about 30 servings so $2.33 per meal…not bad! That sounds like a great solution! I get free coffee at work too–it’s divine :). Thanks so much for stopping by! Thanks for this post. It’s eye-opening how the little things can add up! As much as I love oatmeal, I don’t know if I could eat it every day. Do you ever get tired of eating just oatmeal? I agree, vegan meals are quite healthy and delicious. However, do you think this lifestyle change (eating oatmeal for breakfast everyday and eating a mostly vegan diet) will continue after you guys have moved to the homestead? I know the term “lifestyle change” kind of implies a permanence, but I wonder after you’ve achieved financial freedom, if $1.00 a serving for breakfast won’t seem so outrageous? I guess my underlying question (covered by so many others) is if this “extreme” frugal lifestyle is a short-term thing, and will be willing to splurge a bit more (on bagels! Heaven forbid!) once your short-term goals have been achieved. If you ever tire of eating just oatmeal, we’ve found that eggs and homemade toast, homemade pancakes with honey, homemade granola (and homemade yogurt, but store bought is actually cheaper than buying the milk and culturing your own yogurt), and even just homemade bread, toasted with butter and homemade jam are all pretty cheap breakfast options. These run probably $0.20 – $0.50 a serving, so not quite as frugal as oatmeal, but something to consider if you’re looking for variety. For our part, we do pretty well just by eating breakfast at home. Our biggest costs are when we make smoothies with our fresh produce. Produce is so expensive! Also, if I happen to have to go into the City for work, I can’t resist warm, fresh NYC bagels/bialys!! At this stage of our life, breakfast is less a “meal” and more of a “fueling stop” 🙂 Oatmeal sits in the middle of a venn diagram of Fast, Cheap, Nutritious. We don’t have a particular affinity towards it, but it’s not half bad either! On the homestead I imagine we’d probably mix it up a bit more, if for no other reason than eating with with season. But oatmeal does provide an awesome amount of long lasting energy for a day of hard work. An oatmeal breakfast is a constant when I’m backpacking. I’m a big fan of bagels too! Great bagels aren’t easy to come by up here in Boston, there are a couple of places in Brighton that do a pretty decent job… but nothing near a good NYC bagel. Have you been to Ess-A-Bagel? OMG delicious! I’ve actually toyed with making my own bagels but haven’t pulled the trigger yet. Some things just take too much time for our compressed city schedules. Bet that’s something we’ll give a whirl on the homestead! I’ve made my own bagels before (on a lazy Saturday) and they are a lot of fun to make. Definitely worth a try if you’re interested. I sauteed onions in butter to make a topping and it turned out amazing. I was 12 when I did that so I’m sure your bagels will turn out 100x better than mine did even! I made my own ‘everything’ bagels last summer. They were quite labor and time intensive and timing had to be perfect when boiling, etc. but they did taste great. All in all, I’d just go with store bought bagels. Ya know bagels,regular cereal and regular yoghurt are not as filling(satieting) as let’s say oatmeal,eggs,greek yoghurt or a fruit such as apples. I love to use eggs to make a dish called Shakshuka,eggs poached in spicy tomato sauce,can be eaten for breakfast,brunch or dinner so quite versatile,though I admit to going the oatmeal route the most,which is twice as filling as regular cereal! Oatmeal is so filling! I’m never hungry before lunch, which used to be the bane of my existence! And, it’s just so easy to prepare. I can’t eat oats (I’m diabetic and keep my carbs under 20g/day, which allows me to treat my diabetes WITHOUT any medicine, only with food and exercise) – so I fry up a few eggs each morning on the George Foreman (cheaper than using our electric stove) and top them with hot sauce. We buy 3 dozen eggs at a time from Costco. Another frugal breakfast is Bulletproof Coffee – very filling and filled with healthy fats. Congrats to you for treating your diabetes with diet and exercise–that’s awesome! Eggs are indeed a great frugal meal. We have them for dinner from time to time actually (I’m a sucker for breakfast at dinner). Thanks so much for stopping by and commenting :)! I love oatmeal and its low cost, but try to eat low carb most of the time. Huzzah for oats! Have you tried making “frozen oatmeal pucks” (I know, it does not sound appetizing, but trust me). I make a HUGE batch of oatmeal on a Sunday, let it cool, then scoop it out into one cup servings on a cookie sheet. Cooled oatmeal kind of sticks together like that. I freeze them then toss my pucks into a freezer bag. Mornings I just have to toss the puck in a bowl with a splash of water and heat for about 2 minutes. It is very helpful when I have to be out of the house by 6:30. What a good idea! I’ve never tried that before. We just pour hot water from our electric kettle over our oats, which cooks them up pretty well. But I very much like the portability of your pucks–seems like those could be taken on a hike maybe? I’m always trying to figure out new and inventive ways of making our frugal, bulk food more portable. Do you use the crock pot to cook a large batch of oatmeal for the week? I can’t imagine having to make oatmeal every day. Wasn’t sure if you had any “recipes”, but then again, how hard is it to make oatmeal. 🙂 thanks and really liking the blog. 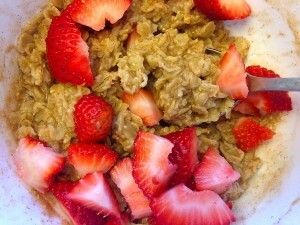 I make oatmeal in the microwave, not ideal, healthwise, but quick and easy. I put a half cup oats in a bowl along with a good shake of salt and about 3/4 cup of water and nuke for 1 1/2 mins. Almost as easy as reheating. I just keep an extra measuring cup in the oatmeal container to save washing it every day, use another to measure the water and toss in the drainer to dry. Love my oats with a drizzle of heavy cream, walmart store brand or a bit of real butter which i catch on sale at my local kroger’s/dillons and stock up. Just recently realized you can freeze butter, so I really stocked up last time. The last thing I do before go to bed is to pour costco brand oats in a bowl, add water and heat it up in a microwave for 3 minutes. When I get up in the morning I add another 3 minutes to it, mix it and let it get cool while I am getting ready to work. I add raisins or honey for sweetness. Costco sells sunmade organic raisins, they are cheep and last for a month or two. I love oatmeal and probably can eat it every day for rest of my life. Sounds like a great system! I’m actually eating my morning oatmeal as I type this and I agree–I love oatmeal! We are paleo so dont eat grains and legumes but do eat dairy. We eat bacon and eggs, or just eggs, and cheese and veggies and apples, homemade cream yogurt, etc. for breakfast, 90% organic, kids do eat cereal, i should get them some oatmeal. Paleo is expensive but there is no going back for us, it feels too good, though contributes to angst over the grocery bill, its through the roof, over 1300 (CAN) per month, (we do buy bulk lambs and cow and pigs though from local farmers). we are family of four and big, me 6′ and pregnant with twins and husband 6’6″ and son approaching teenagehood. though with paleo we do eat less volume of food however….big bag of organic noodles at costco is so cheap!, but still not tempted. so next thing raising chickens, then lambs, then a cow….. this for me is an ambitious plan. 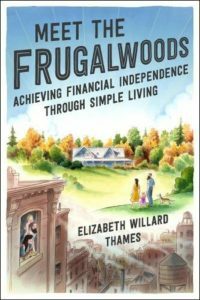 love Frugalwoods, has made such a difference to me in a short time. Thanks for reading, Gwen! I think it’s all about figuring out what works best for you–there’s certainly no one-size-fits-all budget or meal plan. Cheap often isn’t good for health, especially if you are diabetic/insulin resistant. Much cheaper to have your health, no meds, no extra doctor’s visits, etc. Have you considered rolling your own oats? Oat groats are much cheaper and more nutritious as the oats have not been steam treated so retain all the healthy oils. Not sure about the price in the U.S. But in Australia, oat groats are 35 cents for 100 grams. Unfortunately oat rollers are a little expensive but I’m 100% sure you guys would be able to think of a frugal way to roll them. Also, forgot to mention that freshly rolled oats taste better too. 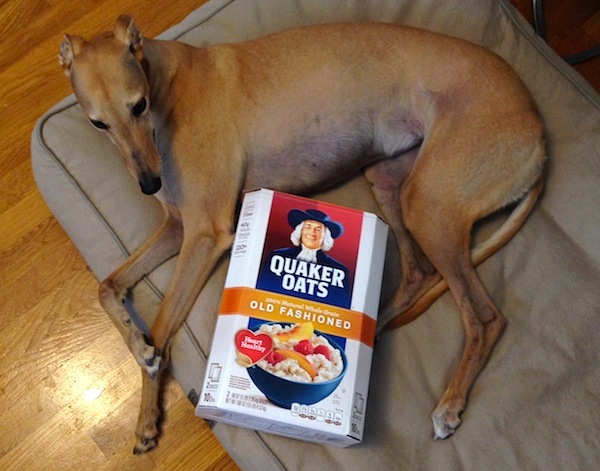 Yeah, our Quaker oats are just too good a deal to pass up :)! Costco has some sweet deals! I’m an oatmeal connoisseur as well. Your price for a 10lb box is great. We have a BJ’s membership and a 5 pound box of Quaker oats is $6.29,so i choose the market basket oats which cost $2.50 for a bit more than 2 1/2 pounds. I wish the husband would join my affinity for oats as that would make a 10 lb box worth it! Yum oats! I really do love oatmeal, I must say :). Gotta love Market Basket too–their prices are just awesome. You can have your food pay for itself if you clip coupons! I can’t go shopping for packaged, personal care, etc. items without coupons. I get everything besides produce for nearly free or free. I’ve been eating Oatmeal for breakfast every day for years. I have been buying instant oatmeal with maple and brown sugar. It’s $2.50 for a 10-pack of 43g packets. I eat 2 every morning so that’s $.50/day for 86g. 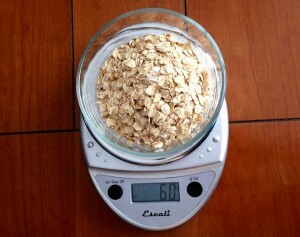 Not sure how you survive all morning on 60g, 86g seems like a small breakfast to me. Then again i’m a 6’5″ 180 lb man. I may have to look into buying in bulk for the plain stuff. It is microwaveable, right? Ever try buying the steel cut oats in bulk? Prices vary but I find the end product to be much less mushy. I bring them to a boil with water at night before bed, then cover, turn off the heat,& let rest overnight. In the morning a quick zap in the microwave reheats, then I add my extras. I make a biggish batch & refrigerate the rest. Good luck with the pregnancy & with reaching your goal! My spouse & I had similar strategies (live in Boston with one car, trash picked many of our furnishings, cook at home almost all meals). It is fun & rewarding, for sure. I’ve recently started making my own yogurt, and it’s great with oatmeal or homemade granola. The instructions on this site have worked for me every time, and a little milk or a few pennies of reconstituted powdered milk are all you need. I flavor mine with homemade preserves, fruit, or the gigantic bottle of vanilla that I got at Costco. It takes 8 hours for yogurt to incubate, so consider either making it on a day when you’ll be home anyway or set it up right before you hit the hay–it doesn’t require babysitting. 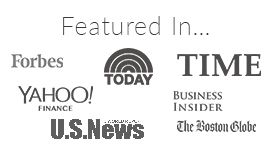 Just discovered your blog and it is so fantastic! Am I the only one that eats savory oatmeal? We do ours (also from Costco), with a pat of butter and a dash of salt. If we’re feeling footloose and frivolous, we stir in a touch of whole milk/half and half. 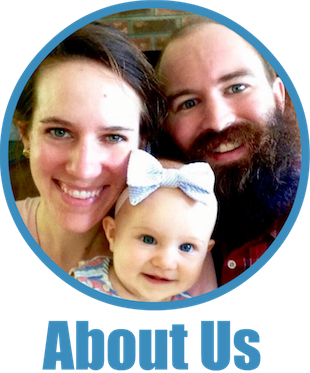 Good luck attaining your goals and thanks for the awesome blog! Love my oatmeal with raisins (Costco) and brown sugar (on sale). The only thing is, I have to cook it myself, usually in the microwave. I absolutely can’t stand the stuff when it has been cooked to paste, as you will often find when cooked in a restaurant or by a food service, served at a hotel breakfast bar, or by many people in their own home. I can’t stand the instant stuff and the pricing is atrocious anyway – why do yu need instant for something this fast? Depending on what oatmeal you have on hand, the cooking time and amount of liquid may need to be modified to get the texture you want. You can also make your own frugal muesli if you plan ahead for it. We make our own Greek yogurt; it is much cheaper than way. You can soak your oats overnight to make them even more healthy! I started my uber frugal month this month. I’m a food hoarded and get my shopoholic kicks in the fresh food aisles, then am too busy and lazy to cook up all them greens. Re frugal breakfasts, I get tired of oats every morning, so now alternate with quinoa. Like oats, quinoa is yummy with or without milk, fruit, cinnamon, etc. Thanks for this blog. I’m learning, and laughing as I go. Being more frugal has so far been a fun and creative challenge! Inspired! I never thought of costing out each meal but today I figured out that just the protein powder for my morning smoothie is $2.25 per day! Plus the frozen fruit and cold herbal tea – I’m thinking it’s $3.00! Back to oats with milk. I started my uber frugal month this month too. Eating up what I have and tracking my daily expenses. I have pounced on debt like a jungle cat! I have been enjoying cold oats in the morning for several years now. 1/2 cup of oats, 1 cup of milk, handful of raisins, and a dollop of peanut butter. Throw in the fridge the night before and then they are ready to eat the next morning. The peanut butter sounded strange until I tried it, now I can’t imagine oats without it! Also I add Peanut Butter either before or after cooking. There’s an oops on my above comment. Water for oatmeal is slightly less than TWICE the oatmeal amount !! So 1/2c oatmeal needs a bit less than a cup of water. In the “lovin’ oatmeal” department, I’d just like to throw out another idea…as a gluten-free frugal type, grinding oatmeal in the food processor yields wonderfully cheap oat flour for baking…much cheaper than the boutique (and not good for you) GF flour mixes out there and quite versatile…cookies, cakes, scones. Also can work where more expensive (and gluten carrying) fillers like bread crumbs are called for in meatloaf/meatball type recipes. As the humble breakfast, I dress it up with cinnamon one day, nutmeg another, cardamon a third…and for a real treat, a little syrup or vanilla (not quite as frugal, but the key word is treat). Yay, oatmeal! In the last year, I’ve started making my own yogurt. It ends up around $0.30 for a 1 cup serving of organic yogurt and could be as cheap as $0.13 for conventional yogurt! Before, I was buying organic yogurt at around $1.25 per serving. It’s super easy to do, great for breakfast and we use it in place of sour cream. I have recently discovered overnight oats. I have a ton of 8 oz mason jars from making baby food, so I put oats in the bottom, with milk, then add yogurt, brown sugar and fruit on top. I also make portions in my 4 oz jars for the baby (minus the sugar). Sometimes I add peanut butter for a more filling meal. I can portion out the whole week in advance and they are ready to go in the morning when I wake up. I’m sure it costs more than just oats because of the yogurt, but it is a very satisfying meal with no cooking. A lady at work says she make breakfast burritos and keeps them in the freezer. Then the kids can just grab them and heat them up before eating. I keep meaning to try this for the older kids (who mostly eat the expensive cereal!). I eventually realized I didn’t even enjoy eating breakfast. So now I just add a tablespoon of chia seeds to the bottom of my cup before brewing, give it a quick stir, then add my half and half. It’s kind of like a coffee tapioca pudding in drink form. And since I can get 3lbs of chia seeds for 9.99, which is 113 servings, it comes out pretty cheap with a fairly nice nutritional profile. I got chia seeds and just make them with water into pudding. Might try making pudding with a little cream and coffee instead. Coffee chia pudding! I like to add cranberries, slivered almonds and l little honey with milk. When cooking, the cranberries plump and are not chewy. Very healthy. So we make our own lattes at home. Sometimes we make Cuban coffee, and add it to a mug of hot milk, stirring some sugar in it. But most of the time, we heat up a mug of milk, and add a teaspoon of instant coffee and a teaspoon of hot cocoa powder mix. It’s so good and the half gallon carton of milk alone is less than a starbucks latte. Then I eat one slice of toast with honey or jam along with it. So maybe .50 cents for the cup of milk, .15 cents for the cocoa and coffee, .15 cents for the toast w/ jam? Ive got a baby crying so my math is a very quick estimate! bye! I like this idea, but I’ve heard oats are problematic when consumed frequently because of their phytic acid content, and can inhibit absorption of other nutrients?